Will new Governors care about the Great Lakes? As summer fades, the November elections are on the near horizon, and core Great Lakes states are in the spotlight in the gubernatorial races. Minnesota, Michigan and Ohio will elect a new governor and Wisconsin could, too. Incumbent Scott Walker is seeking re-election but has a serious challenger in what could be a close race. The current four governors have been in office since 2011. Governors are important because they set policy priorities, and there is no shortage of environmental issues to focus on in the Great Lakes region. Great Lakes Now did an informal canvass of the four states, checking with local experts and scanning campaign websites to see what priority the candidates were giving to environmental issues. It would be easy and accurate to say none of the candidates rank environmental concerns near the top of their “issues” list based on what they put on their official campaign websites. But environmental issues can morph into other issues. Here’s a closer look. “No one is talking about climate change and the impact it’s having to the region’s water and agriculture,” Minnesota-based water policy expert Lynn Broaddus told Great Lakes Now. She says water isn’t on top of either candidates’ issues list but notes that water is generally well-funded in Minnesota. Broaddus says agricultural runoff should be an election issue because it impacts water quality. The runoff’s volume is causing scour (the removal of sediment) in the Minnesota River that can erode the river’s banks and increase pollution that would end up in the Gulf of Mexico. Democratic candidate Tim Walz’s website has a page devoted to environmental issues where he lists reducing carbon emissions and increasing renewable energy as priorities. Walz says he wants to work with farmers on clean water solutions but does not address the hard issue of regulating runoff from farms. Working with farmers on water quality has been a contentious issue in Minnesota with outgoing Gov. Mark Dayton. On his website, Walz’s Republican opponent Jeff Johnson talks about agriculture and natural resources and says government “too often harrasses farmers” via the permitting process. He says mining and protecting the environment can coexist in Northern Minnesota. Johnson says the people who live in rural Minnesota “are better stewards of the land than any bureaucrat” in the state’s capitol. Rowen, a frequent critic of incumbent Gov. Scott Walker, notes “the scrub of climate change science and materials from the Department of Natural Resources website” under Walker. Rowen writes The Political Environment blog, and says wetland loss under Walker should be a priority issue in the election given its impact on water quality. Without providing specifics, Evers’ site says he’ll focus on clean water and air, and work to restore Wisconsin’s “legacy of conservation” while supporting the Paris Climate Accords. Gov. Scott Walker’s website does not mention environmental issues. Reacting to criticism of environmental concessions his administration has given to tech giant Foxconn, Walker published a ‘Fact vs. Myth’ paper that that talks about wetland loss mitigation, meeting Clean Air Act standards, and allowing a diversion of Lake Michigan water. 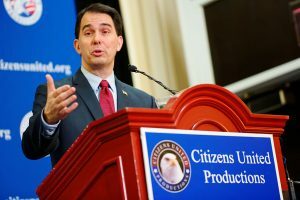 Attracting Foxconn to Wisconsin is Walker’s signature economic accomplishment. “There has been a shift in public awareness of the value of water” in the Great Lake state, veteran environmental activist Cyndi Roper told Great Lakes Now. Roper bases her statement on public reaction to water issues like Flint, the current PFAS crisis, and the decision to allow Nestle to pump more water for bottled water. “Water should be a critical piece of the next governor’s policy agenda,” according to Roper, a Senior Policy Advocate with the Natural Resources Defense Council. Roper also called for a focus on water affordability in the state surrounded by water, but says water shutoffs in economically disadvantaged communities like Flint and Detroit are not uncommon. Republican candidate and current Attorney General Bill Schuette’s “Plan for Michigan” website does not list environmental issues, but he has a track record as attorney general. He has been vocal about the aged Straits of Mackinac Line 5 pipeline, frequently saying, “Its days are numbered.” Activists have called for the pipeline to be shut down and have ratcheted up the pressure in recent years. As attorney general, Schuette has been aggressive in bringing criminal charges against state officials his office alleges are complicit in the Flint water crisis. Democratic candidate Gretchen Whitmer’s website under the heading ‘Get it Done: Clean Water for Michigan,’ contains ten pages of bullet points highlighting issues that need attention. Most issues that impact water are listed including PFAS, Line 5, bottled water and more. The department will serve as a “Michiganders collective water steward,” the site says. “We have research universities, we have Midwestern grit, and we have water. As Governor, I will bring people together to make Michigan a world leader in water policy,” Whitmer says. What to do about Lake Erie’s algae problem is the overarching issue in Ohio. Either Republican candidate Mike DeWine or his Democratic rival Richard Cordray will inherit the issue that pits northern Ohio against powerful agriculture interests and its supporters in the state legislature. Richard Cordray’s site references complex environmental challenges farmers face but it does not connect the challenges to Lake Erie’s water quality. Separate from their websites, both DeWine and Cordray have said they will work with agriculture interests on Lake Erie’s algae issue. If the candidates are looking for help in setting environmental priorities longtime Michigan, Great Lakes and international water executive Lana Pollack has some advice. Separate from the November election, Pollack recently told Great Lakes Now that the region needs to pay attention to the impacts of climate change. Editor’s note: If you want a deeper dive on where the candidates stand on environmental issues, go to the campaign websites that are linked in this article. Thankfully, residents of Michigan have another option in the race for Governor of someone with a strong background in public policy, environmental issues, and has done the research on these important water issues in our state.